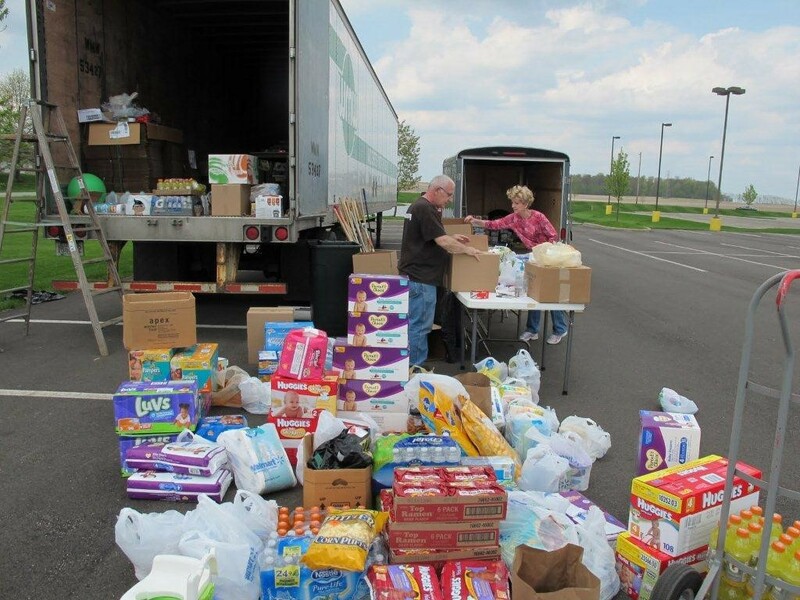 The Grace Brethren Church of Wooster, Ohio, recently mounted a campaign to gather and ship relief supplies to storm victims in the southern U.S. Here, excerpted from a longer blogpost, is a narrative of the event created by Ivanildo Trindade, associate pastor of outreach ministries at the Wooster church. On Wednesday morning, May 4, I set up the little white tent. That same afternoon the trailer was brought and parked on our parking lot. By now we had changed the church sign, ordered a huge banner, advertised all over Facebook, the website, via press release to the media and even radio stations in the area. On Friday morning I did a live interview on the radio. On Thursday, May 5, Craig Winey showed up to volunteer and brought a brand new chain saw. He said that when the owner of Smith Dairy heard about what we were doing, not only did he authorize for a flyer to be made and circulated around the company, he also gave Craig a credit card and told him to go a buy a new chainsaw to send along. That piece of equipment alone was over $300. By Friday, May 6, donated items began to trickle in. At the end of that day Tim Thorpe gave me a total for the money which had been specifically donated for the relief fund so far and on that same night Tim and Jeana Harley and their family went shopping at Sam’s Club. They made quite an impression on the clerks at the store. The main lady helping them said that it was the largest order she ever processed. They spent over $3,700 that night, primarily on baby diapers, wipes, food, formula, various juices and paper goods. Harley Drilling also made a generous contribution toward the purchases that night. On Saturday, May 7, Rob Miller showed up with a huge Smith Dairy trailer filled with 1,920 gallons of water, and he helped us load it onto the WMW trailer. The money for the water was provided by the InterAct and the Fidelis ABF’s. I was by the trailer most of the day on Saturday but very thankful for the volunteers who came. We had a grill going and offered free burgers and hot dogs to people who brought stuff. It was wonderful to serve those who were serving! On Sunday, May 8, I was in church meeting with visiting missionaries, Rob and Nicole Plaster, just opened the door of what ended up being a memorable day. Steve Crisafully showed up to volunteer at 8. He was supposed to help until 10 but he ended up staying until 7:30 p.m., mostly inside the truck loading boxes. The preaching on Sunday morning got a lot of people motivated to donate. Some people actually stopped by on their way out of the church either to give a check or ask what we still needed and how long we were planning to be there. Some made two trips to the store because they wanted us to fill the trailer as much as possible. As we sat by the trailer waiting for the ladies to finish shopping, Bruce Imhoff called his boss at Wayne Health and somehow got them to donate a trailer full of stuff – wheelchairs, walkers, canes, mattresses, adult pads, etc. We gladly helped him unload that stuff and put it inside the trailer. Monday I called the owner of Wooster Motor Ways and he sent a driver over who picked up the trailer. Pastor Matt Carter and I stood around the driver and prayed for him and for the load to be delivered safely and to be a source of encouragement to many people. Then we watched the truck slowly leave the parking lot and hit 83 heading south, carrying 28,000 pounds of generosity. What a blessing to see all of this come together in such a short period of time! Let’s pray that each item finds a needy family, a lonely child, a grieving mother, and brings them some relief, at least for a while in this time of tremendous sadness in their lives. Thank you all 30 plus volunteers who made this a huge success. May God reward you for your efforts. PS. : As I finished writing this. I received a nice e-mail from the driver saying that all of our stuff was delivered safely to a very good Christian ministry who is doing an outstanding work helping people affected by this disaster. He was very impressed by the operation and people expressed their thankfulness and amazement at how much we had sent.